Every month or so, we visit our most favorite and trustworthy fishmonger to get a slew of the freshest sashimi grade fish and the likes to satisfy our sushi cravings. 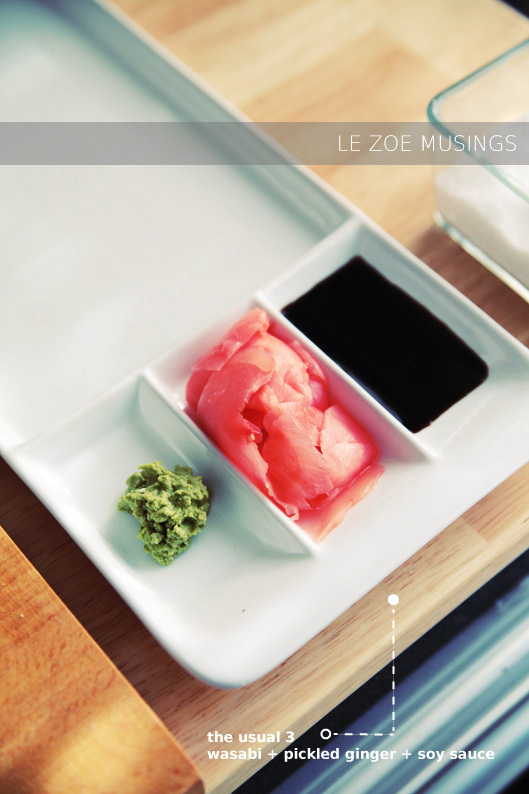 What you’ll find on our to get list are the usual consisting of tuna, salmon, scallops, uni, bbq eel, + salmon kama. So a few weeks ago, (loyal to our tradition) the hubs and I ventured out to grab some scallops, salmon, and bbq eel. Because it was just me and him feasting this time, this was more than enough. My husband is a GREAT cook. I learned how to cook many authentic Vietnamese dishes from him (he got it from his mamma!). 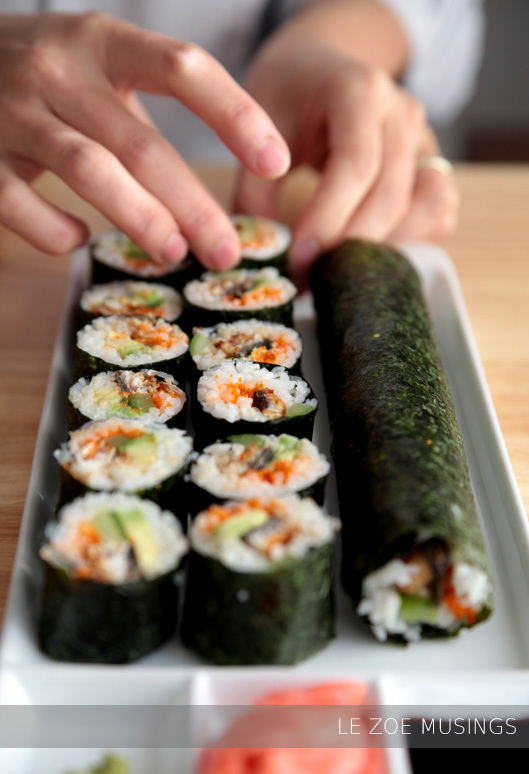 I also learned how to make sushi rolls from him. A lifetime ago, when we were dating long distance (long distance for over 8+ yrs! !…there’s hope! ), he would ALWAYS make sushi for me when I came to visit. It was the one thing that I would look forward to the most. 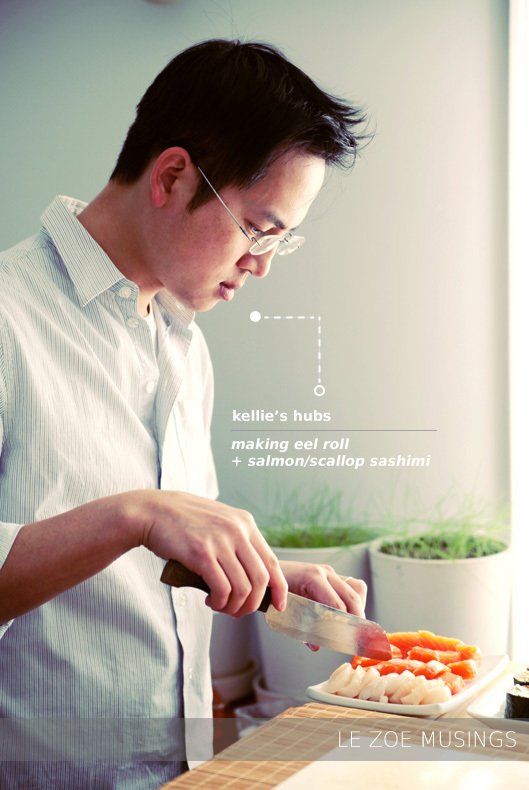 Fast forward to the present and a baby later, the hubs whipped up some eel rolls and salmon + scallop sashimi. I told him that I wanted to photo-document the preparation. I tried to be as unobtrusive as possible. Using my MOST favorite knife (kiwi brand @ oriental markets), so dirt cheap (< $5) but performs like a pro! I LOVE that the blade is almost paper thin. 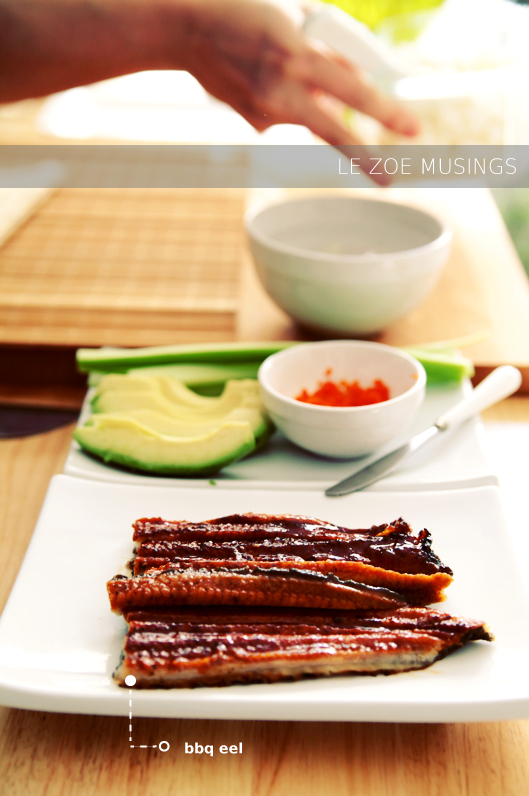 Typical ingredients that go into an eel roll are bbq eel, avocado, and cucumber. Lo and behold, we were out of cucumbers so we substituted w/ celery. Not typical but we like the crunch. Also, fish roe was added. 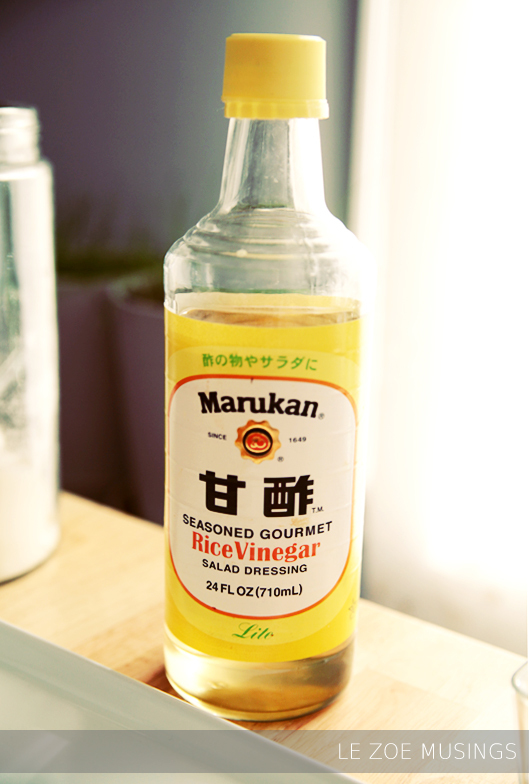 This step is usually eyeballing… a few splashes of rice vinegar, a dash of sugar + salt. A bowl of clean water for rinsing sticky fingers. We buy wasabi powder instead of the premade concoction. 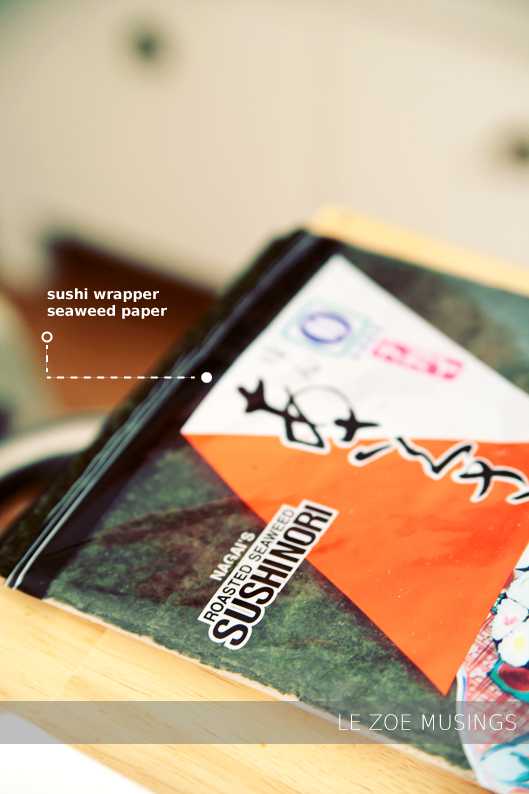 Just add water to the powder each time for freshly made wasabi! Now on to sashami. 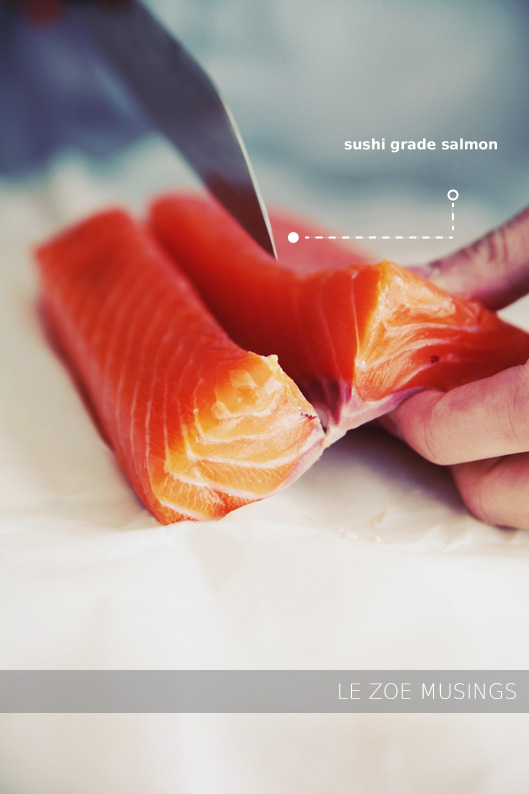 Salmon is one of my favorites…fresh and buttery! 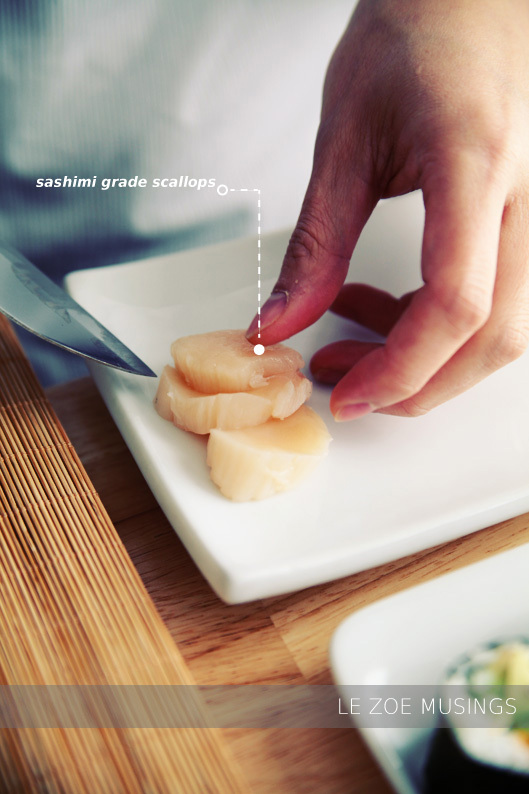 Scallops have a nice sweet taste. 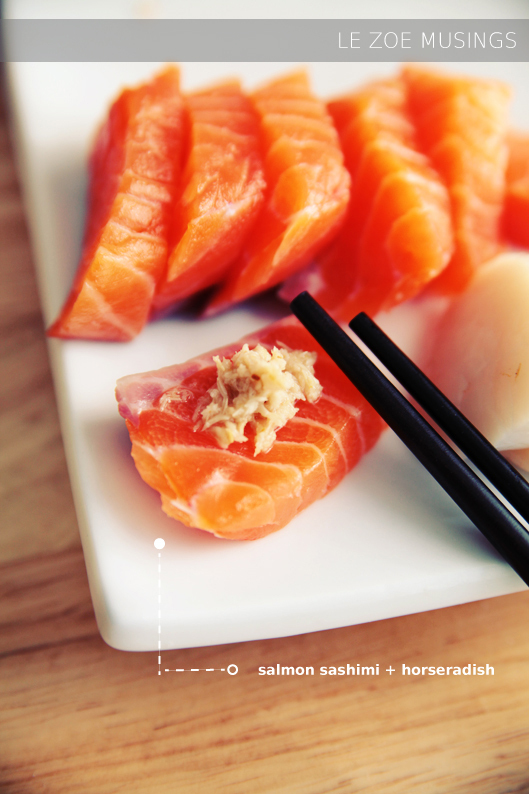 We usually enjoy sashimi w/ horseradish, also untypical. Thanks hunnie for a delish meal and putting up w/ the annoying camera clicks! Hope you enjoyed this food post and have a GREAT Monday! Hi Emily- I think the key is the source. You have to make sure that they are selling sushi grade fish. We also yelp our store and they had really great ratings. Good luck! Fantastico! complimenti, arcobaleno di colori e sapori, mi viene voglia di intentare anch’io! This looks absolutely ah-ma-zing! AND I have to echo that your photographs are fantastic. 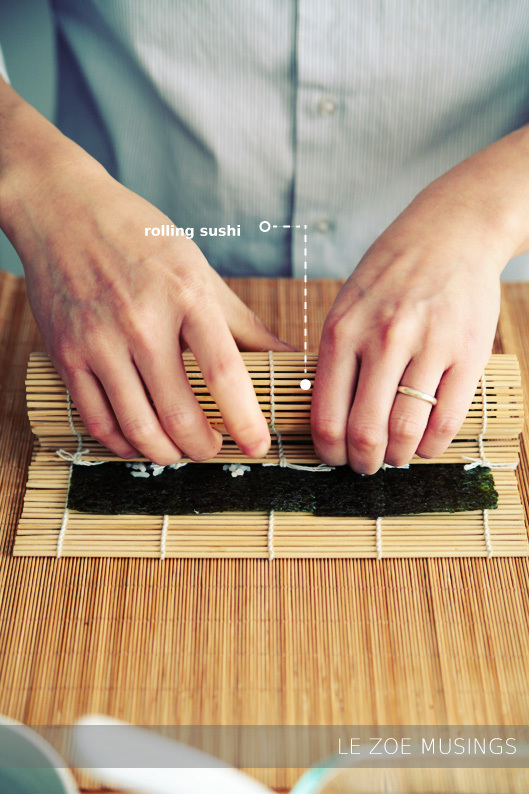 I really want to make sushi now. Your photos are amazing and I love your blog! You’ve got another follower! this looks so professional! I tried it once and mine didn’t even look remotely like yours! 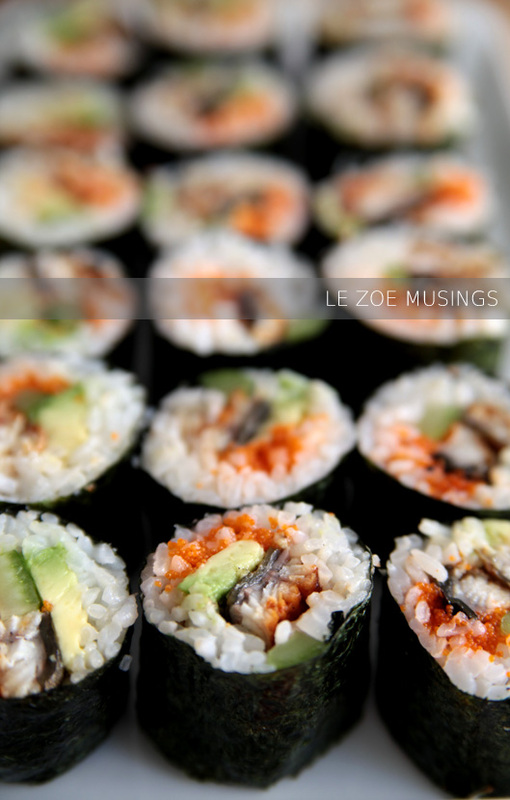 I absolutely love Sushi and I love cooking soooo the too together is the Bomb! I’m now feeling really quite hungry…looks gorgeous. 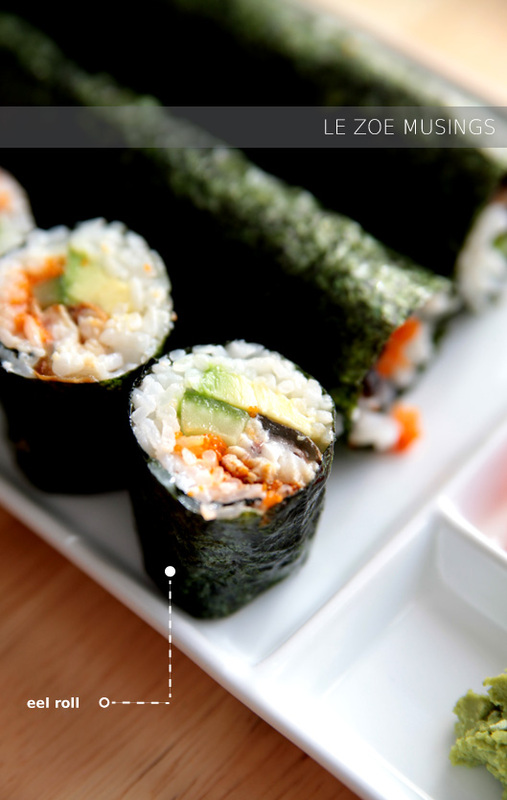 I think I might make sushi for tonight… haha. Thanks for the idea zoe! 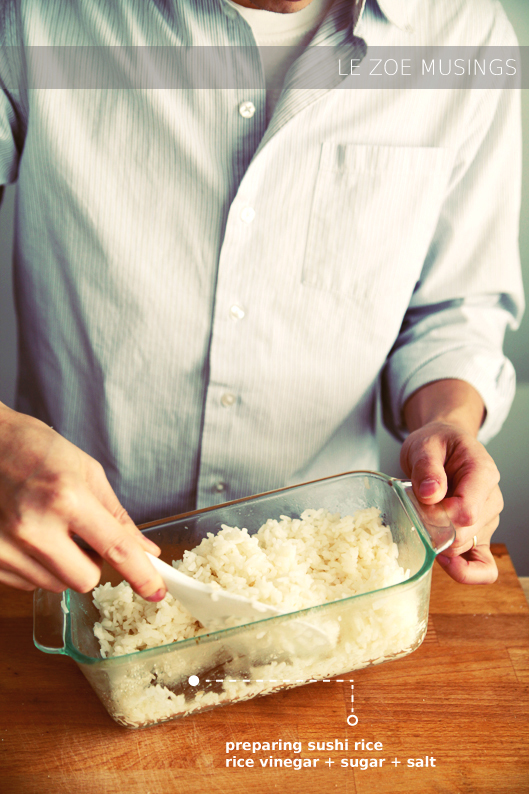 Do you have an alternative to rice vinegar? Hi Annie- You can substitute with regular cooking vinegar. Good luck! That looks delicious, colorful, fresh, fantastic…! Wow! Lucky Lady! That looks fantastic! It is a special dinner for us and when enjoyed it is always memorable…somewhat like your post about making it. When my son was home on leave from the Navy in the fall of 2008 we went to a Japanese restaurant and he surprised me by ordering eel sushi! He’s pretty adventurous like that. I tried it too but I really couldn’t tell what the eel tasted like. You captured the preparation beautifully! Sushi is my favorite date meal! That looks great! 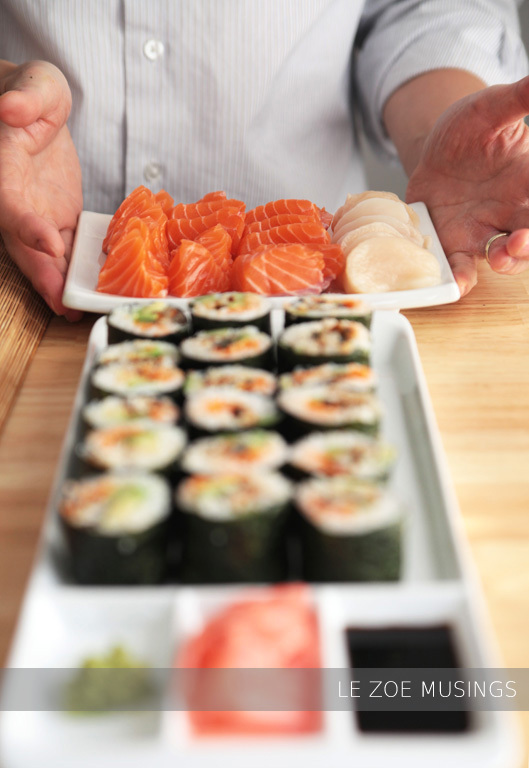 Any man who can make sushi like that is a keeper for sure! Whenever you have a fight just remind yourself…. 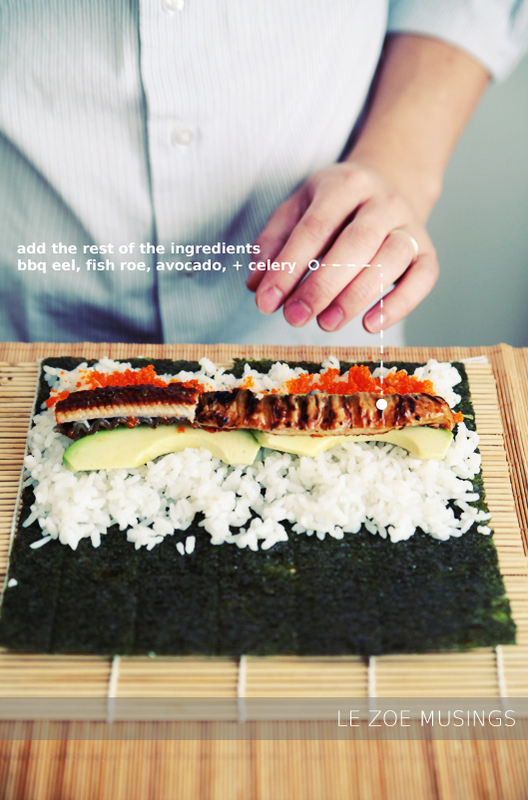 he makes sushi! That looks wonderful! I ate sashimi for the first time with my dad two weeks ago and it was so so good. I still don’t know if I can get over raw fish… though to enjoy eating out with my dad, I’ll try *almost* anything. Looks delicious! I am sure it tasted as good as it looked. Beautiful AND delicious! I’m going to shop for that knife (you can never have too many awesome kitchen tools, right?!) – thanks for the recommendation and the fantastic blog! Oh gosh, you have SUCH a good camera. I’m only working with a canon t4i. Can you go over the types of lenses that you use in one of your blog posts? I’m super interested in what you have. beautiful fotos, kellie! i have never had raw scallops, though i hear they can be to die for if from the right source! i miss the east coast the most for the seafood! Your blog is relentlessly stunning! Every time we think we’ve seen enough, you surprise us! Thank You. Isn’t is great to have a partner who cooks? My boyfriend is half Japanese and he’s always making me amazing Japanese dishes. It’s the best! I love you photos! OMFG! This looks so DELICIOUS! 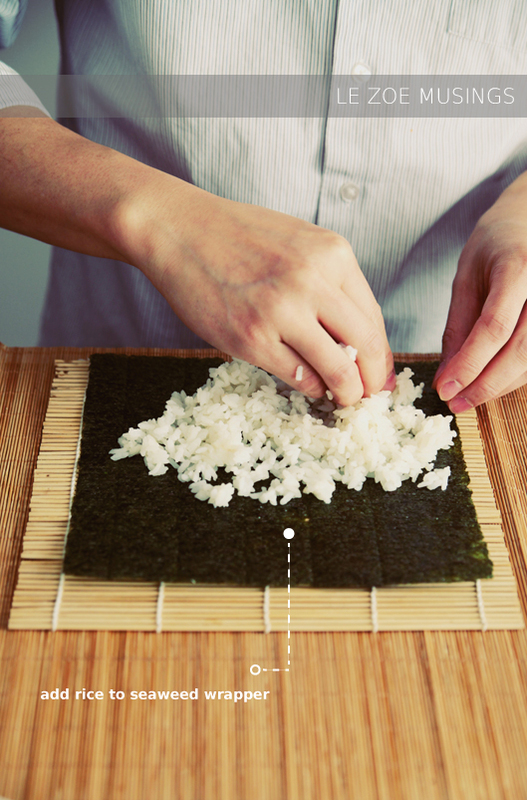 I’ve made sushi a dozen times before, and let me tell you, it can be a messy messy process. But you guys make it look so clean and zen!